I have been slowly building up the layers of watercolor pigments for Joyce's hair and face and am now really focusing on achieving a likeness as best I can. 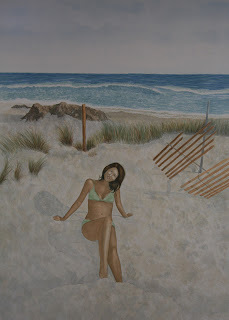 I added more details to her bathing suit and a few more layers of skin tones. Some of her skin areas need to be softened a touch once dry. I will then deepen the shadows in the sand and add a touch more depth to some of her figure, using hard and soft edges so that she has more dimension but does not look cut out. I darkened the sky and will continue to deepen to give a nice rich blue sky color. Then it is onto the finishing touches on the grass, fence and rocks. It looks so much prettier in real life than online, the colors are much richer in real life. I actually surprised myself when I just looked over to my easel after typing this in, I have to figure out how to take better photos! !